Disney World Restaurants that girls will love! Hollywood & Vine is located at Hollywood Studios. They have characters for lunch and dinner dining as a buffet. It’s counted as 1 table service meal. The characters are: Sofie the First, Doc McStuffins, Jake and the Never Land Pirates, Handy Manny. Chef Mickey’s is also a buffet, counts as a table service meal and features Mickey Mouse, Minnie Mouse, Goofy, Pluto and Donald Duck. It is located in the Contemporary resort. It is extremely popular and fills up very fast. 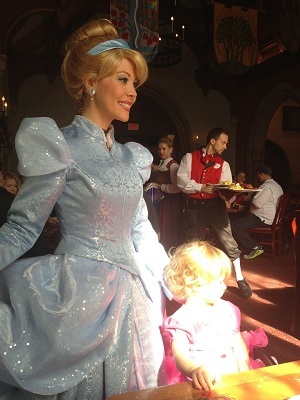 If your little girl loves princesses, Akershus Royal Table, located in Norway at Epcot, is a must do!. It is a buffet counts as 1 table service meal. They offer a Princess Story Book dining. The princesses vary but include Snow White, Cinderella, Belle, Princess Aurora, Ariel and Mary Poppins. The guests get a photo with a princess, each princess goes to each table and then they do a processional with all of the princesses and princes in training at the meal that day. It is a lot of fun and little girls love it. The food for breakfast is American and some Norwegian but dinner is mainly Norwegian cuisine. 1900 Park Fare is located in the Grand Floridian. They offer a buffet meal and have visits from Mary Poppins, Alice In Wonderland, the Mad Hatter, Tigger and Winnie the Pooh. It is beautiful and every table gets visited. Wonderland Tea Party is located within 1900 Park Fare. Have a tea party with Alice and her friends, reservations are a must. Cinderella’s Royal Table is a must!!!! All girls love this one. It is located in Cinderella’s castle. They serve lunch and dinner. It counts as 2 table service meals. Each child will get a photo with Cinderella and a wand. Reservations fill up so quickly, that you may want to make these reservations first and work all of the rest of your dining around it. Crystal Palace is located in Magic Kingdom. This is a buffet, counts as 1 table service meal and Winnie the Pooh and friends are featured. Sci Fi Diner is located at Hollywood Studios. 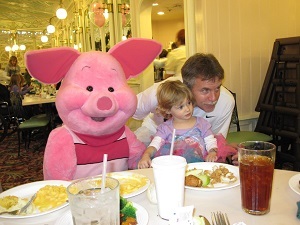 This is not a character breakfast but the girls and boys still enjoy this restaurant. The setting is a drive-in movie theater and they play some parts of scary movies made in the 50’s/60’s mostly. The movies are not really scary but the tables are put in the front and back seats of old cars and their menu is like a diner, hamburgers, hot dogs, fries, onion rings, soda and shakes. Sharon is My Vacation Lady’s Disney Specialist and has taken her children and now her granddaughter to Disney at least a zillion times. Let Sharon help you plan your stress free Magical Vacation to Disney World! By Mindy Gilbert|June 20th, 2016|Categories: All|Tags: Dining at Disney World, Disney World Specialist, Disney World Vacation, planning a Disney vacation, Princess dining at Disney World|Comments Off on Disney World Restaurants that girls will love!